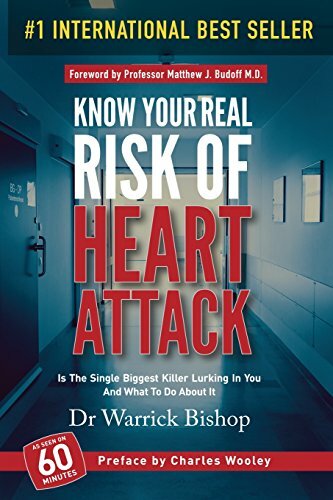 Dear Dr Bishop, I am honoured that you took time from your busy and important schedule to advise me that I had won a copy of your book, “Have You Planned Your Heart Attack?”, in an RACQ competition. When I received the parcel and unwrapped the book I was impressed by its presentation which inspired me to want to read its message. To a ‘non-medical’ person the simple language style and the colourful diagrams, illustrations, etc., together with the easy to follow scan illustrations, highlighted the appeal of the publication and formed my view from the beginning that this would be a book conveying a ‘technical’ message but in a way that a lay-person could easily read and comprehend. I wanted to read to determine the message that you had compiled for me. My apologies for delay in commenting but I have now completed reading your book and have appreciated its message. I now have a far greater knowledge of the physiology (hope I got the correct word) of the heart, the types of issues regarding heart disease, major adverse coronary events and stroke. I am now aware that there are means of early testing and risk determination to allow for the early intervention and treatment aimed at prevention of major adverse coronary events. The use of CCT, CCTA, CCS, C-PLUSS, etc. for early assessment and follow-up made a lot of sense to me. At almost 77 years of age I consider myself lucky as, to date, I have had no major heart issues and family history had not been a concern. My doctor has always been satisfied with my regular blood test results, blood pressure readings, etc. and I have not experienced any heart problem symptoms. It is only this month that my doctor has noted elevated blood pressure concerns and I am regularly re-testing prior to follow-up consultation in just over a week so my doctor can consider medication requirements. I was diagnosed with ‘right bundle branch block’ about five or so years ago but this does not appear to be a problem. Maybe the use of your idea of CCT, CCS, etc. some time in the past would have told me that I was not so lucky at all and that I had risk factors needing attention. I have enjoyed the book and thank you for the tremendous work that you put into writing and producing it – it was an informative and entertaining read. I wish you every success in establishing conversation to raise awareness of coronary disease and improved patient care. I will have no hesitation as opportunity presents to inform friends or family members of your book and the early detection and remedial action that it highlights.